The first part of this activity illustrates the concept of albedo. Students use a year-long dataset of incoming and outgoing radiation from Eureka, Canada to calculate albedo values and see how albedo varies through the year. Next, students dive into the datasets using Excel. Using step-by-step instructions and screen shots students create line graphs of springtime temperature, snow depth and albedo. Once the graphs are plotted, students can see the relationship between these three parameters and can explain why the snow depth decreases rapidly. Students then create a concept sketch and a write short essay to synthesize what they have learned about albedo and how it relates to climate. 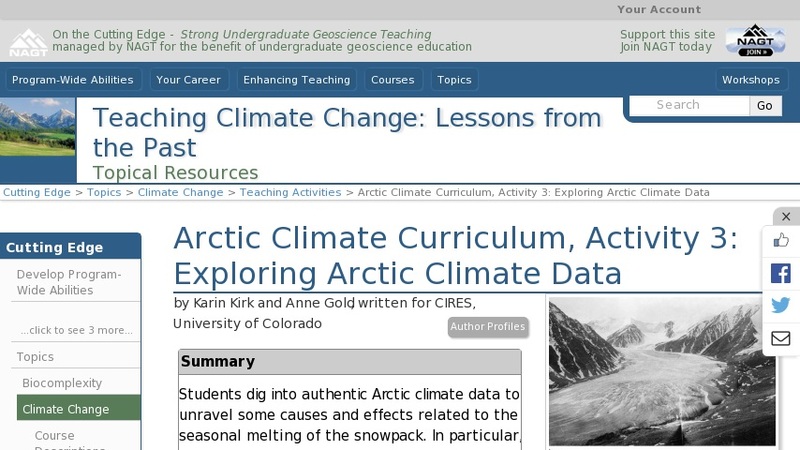 The final part of the activity uses paired imagery from the Arctic to compare changes in albedo in recent decades. The takeaway message emphasizes how decreasing albedo is a self-reinforcing feedback mechanism. (Also known as a positive feedback mechanism.) Two optional follow-on activities are included. The first uses images and data from Greenland to further examine albedo changes on the Greenland Ice Sheet. The second activity examines a case study from Colorado about dust layers on the snowpack and the implications for melting, runoff and water supply management. This activity has ties to public policy.